You Have to Experience it To Believe How Wonderful It Feels! 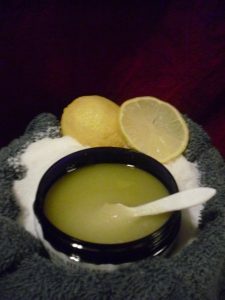 LUXURIOUS LEMON EXFOLIATING DEAD SEA SALT SCRUB Exfoliates dead skin cells while moisturizing your skin with a combination of the best body oils nature can offer! An utterly indescribable cleansing experience. Treat your hard-working, toxin-laden body to the treatment it deserves. Infuse your skin with minerals from Dead Sea Salt while you exfoliate dead cells and lavish your body with the best oils nature can offer for an amazingly soft result. The cleansing scent of the pure lemon oil will put you into ecstasy! Contains: All Natural Luxury Skin Oils: Jojoba Oil; Sweet Almond Oil; Avocado Oil; Lemon Oil, Olive Oil – and more with Mineral-laden salt from The Dead Sea. ALL INGREDIENTS ARE NATURALLY DERIVED FROM THE EARTH. NO SYNTHETIC OILS.